Twenty-seventeen was a record setting year for the Fort Lauderdale to Key West Race (January 11 – 13). Fresh easterly winds allowed David and Peter Askew’s R/P 74 Wizard (Baltimore, MD) to shave a few minutes off the impressive mark set by Joe Dockery’s R/P 81Carrera in 2005 and propelled nearly all the fleet home before the sun rose in Key West. I sailed the race aboard Jason Carroll’s Gunboat 62 Elvis (New York, NY), an annual tradition on the boat for the last five years. We did a few days of warm up out of Ft. Lauderdale and it was absolutely smoking from the northeast. The Gulf Stream was pressed quite close along the Florida coast and once you got into it the waves were truly impressive. Our goal was to push the boat and find the weak points. We probably overachieved on this, as we returned to the dock early each day with gear failure. If the conditions persisted this would certainly be a full-on race. The collected fleet was abuzz at the skippers meeting on Tuesday evening at the Lauderdale Yacht Club as the forecast looked excellent for a fast race. Teams got busy comparing their fast routing times, and some rum-fuelled bets were laid. The terms “record” and “beating last call” were bandied about freely. 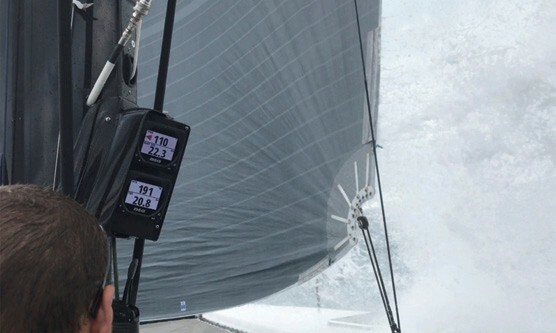 When the monohull record fell in 2005 the conditions were absolutely perfect. The fleet started in a fresh NNE breeze, which shifted right as the fleet made the turn to the west to skirt the Keys. The only jibe was at the Key West sea buoy for the run into the finish. Carrera famously broke their rudder when close to the final turn but managed to finish with the stump and still grab the record. Two years later and almost two hours faster was the soft-sail Stars and Stripes catamaran, which found similar conditions on the 160-mile course and reached her way to an almost unbreakable record of 8 hours, 31 minutes. Race day dawned with the forecast ENE winds of around 20 knots, present and accounted for. The monohulls blasted off the line with jib tops and genoa staysails as the preferred setup. The multis started last with some testing out screachers, but most reaching along comfortably with mains and solents. After a good start at the pin the fun began aboard Elvis. Multis in general, and Elvis in particular, love the wind around 90-100 TWA, which is what we had for the first three hours of the race. In about an hour we had passed Wizard and were blazing our own trail, making between 19-25 knots. It was sort of a Tale of Two Cities on the boat with the helmsman, mainsheet trimmer and traveller man aft and relatively protected, while the trimmers in the forward cockpit were taking a beating as the waves came aboard and dealt out repeated body blows. Having the good fortune of being forward, I silently added up how many beers the helmsman would owe us for each mistimed wave or slight steering error; the number got very high. As the Keys faded off to the West, the fast reaching turned into a VMG run. Any thought of the record went out the window as our VMC dropped to around 14 knots, though we were sometimes sailing twice as fast through the water. Conditions turned puffy and squally with TWS reaching into the mid-30s at times. The boat has a hard-luffed A3, which, along with the powered winches, made the many jibes relatively easy. The routine became familiar: get out into the Gulf Stream on port and take a pasting from the lively sea state, jibe back into the relatively flat water by the reef, rinse (literally) and repeat. Our navigator, Anderson Reggio, called the turns to perfection and got us on the right side of the squalls. The Key West sea buoy was soon upon us and after a puffy close reach we stopped the clock at 10 hours, 48 seconds to notch the fastest elapsed time in the fleet. Wizard’s record-setting run was good enough to get the “triple” in the IRC fleet (line, class and handicap honors). Karen & Chris Lewis’ J/44 Kenai (Houston, TX) took home the chocolates in the ORC fleet, while Bill Bollin’s Melges 32 Badfish (Sylvania, OH) continued her winning ways by taking PHRF fleet honors for the second year in a row. For full results, go to keywestrace.org.